The Springboks tackle the All Blacks in the 96th meeting between the two nations off the back of four defeats in seven matches. There are proper problems for Rassie Erasmus and his team to overcome and, to put it into perspective, at this stage last season Allister Coetzee’s side was unbeaten. 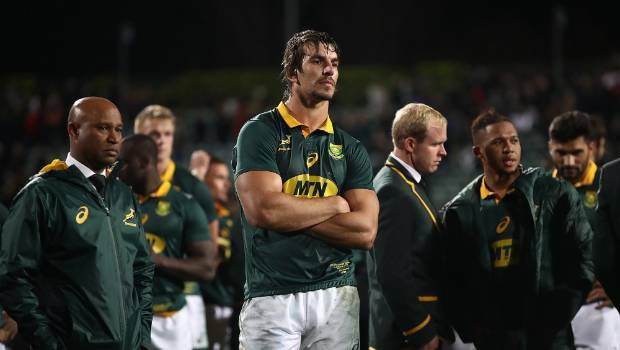 The Boks cannot win the Rugby Championship anymore, but they can regain their respect. 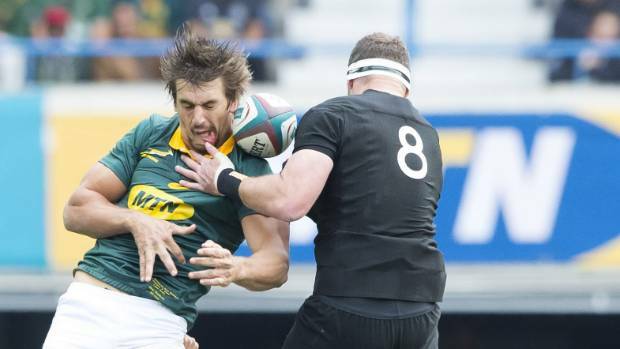 As gloomy as it is for South African rugby at the moment, I believe there is no value in dwelling on the fact that the Springboks have lost 15 of the last 17 encounters against the All Blacks since 2009. Rugby is an amazing game and beating the All Blacks in Wellington on Saturday should not be regarded as mission impossible. While the All Blacks won against the Pumas, they were average in Nelson. If Erasmus can take the lessons we learned from Albany, which were applied in Cape Town last year, Wellington could prove to be the turning point in his national coaching tenure. Coetzee effectively lost his job in Albany, and Erasmus can retain his with a good performance in Wellington. There is a very specific way of playing against the All Blacks and if you deviate from said plan, which is what happened in Albany last season, you can bleed heavily. In trying to beat the All Blacks, there are three main elements you must be very aware of. 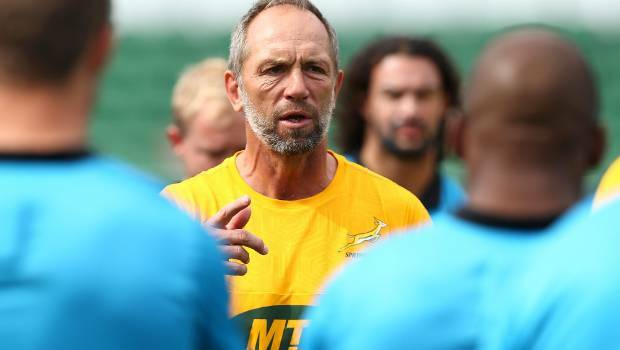 The Springboks can beat the All Blacks if they play to their traditional strengths, vows former Boks midfielder and assistant-coach Brendan Venter (file photo). All three are actually controllables, which you are in charge of as a team. Firstly, the All Blacks play for territory and, if you want to beat them, you have to at least match them in the kicking stakes. You can’t afford to kick for distance and need to put in contestable kicks because the men in black are lethal at running the ball from the back. When the kick is contestable, it buys you time to reset your line. At the moment, the Springboks often have eight players on the floor or standing around the ruck when they kick, which leaves them with only two players in the back field and one kicking. It translates to four players having to defend the 67 metre width. If the visitors don’t get that right on Saturday, the All Blacks will run them off their feet. The Springboks look dejected after a 57-0 drubbing at Albany in 2007. Secondly, the Springboks will have to protect their ball possession because the All Blacks’ counter-attacking and turn-over ability is second to none. The Springboks need to keep it tighter than ever before because if you force the pass and the All Blacks pick it up, you are in trouble. Thirdly, when facing the All Blacks you have to prepare extremely well to defend the set-phases. Historically, the All Blacks have scored a high percentage of tries from scrums and lineouts. If the All Blacks aren’t able to score off counter-attack, turn-over possession or set-piece, you have a really good chance of beating them. It’s not just wishful thinking because, as outlined, there is a way to beat the All Blacks. However, if you fail to get the aforementioned aspects of play right, you won’t get one over them. 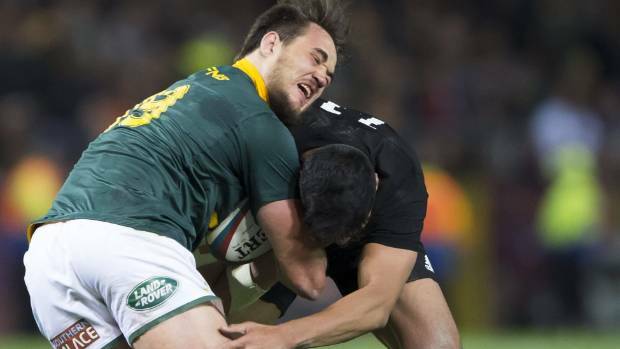 Franco Mostert takes the tackle in the Springboks-All Blacks clash in Cape Town in 2017. The primary reason the Springboks are playing so poorly at present, and have suffered consecutive defeats, is because there are no settled combinations to speak of, with Erasmus chopping and changing the team every single week. The most important thing Erasmus needs to do is stop talking about creating depth. This Springbok side desperately needs continuity and Erasmus must now select the same team for the next three matches and say to the group: “You are the players that are going to get a proper go.” In direct contrast, it’s easy for the All Blacks to continue building depth because even when they have a sub-par performance, as evidenced against Argentina, they still win. Kieran Read (R) and Eben Etzebeth contest lineout ball at Newlands (file photo). 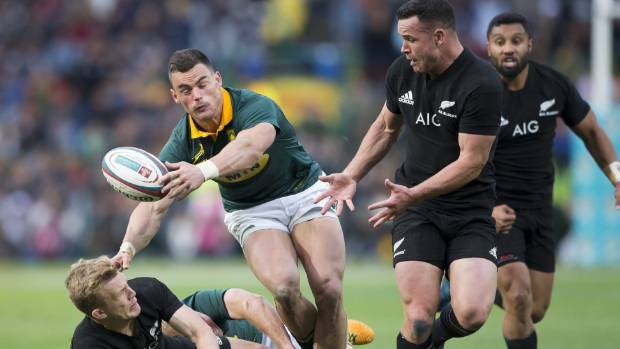 The Boks have been criticised in the past for being overly-conservative, but against the All Blacks it’s a good idea to play among the forwards and off number nine. The current side must heed the lesson from Newlands in that you don’t physically dominate another team individually; you dominate them as a unit. We came close to beating them in our last fixture because we applied a completely different approach in each area. We learned that you cannot beat the All Blacks at their own game and must play to your strengths. The boys knew they had the beating of the All Blacks and, when they came off the field at Newlands, we knew we had lost that one rather than them having won it. Brendan Venter says beating the All Blacks in Wellington is not Mission Impossible for the Springboks. Hahahaha – we did not do any of the 3 that you mentioned mate…. and still won! No wonder you and AC were nowhere!